The "third age" is described as the period in the life course that occurs after retirement but prior to the onset of disability, revealing a period in which individuals have the capacity to remain actively engaged. This book serves as a comprehensive discussion about how the emergence of the third age has changed the way we think about and examine traditional frameworks regarding aging issues and the life course. 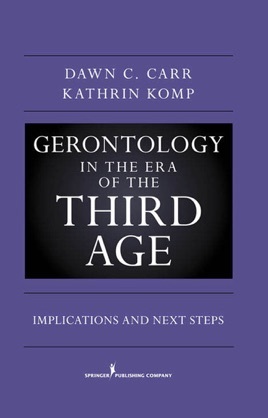 It introduces the discussion of the unique challenges and opportunities that older adults face while moving through this early phase of later life, proposing new frameworks, concepts, and methods to re-examine later life in the context of the era of the third age. This book proposes new ways of thinking about how we conceptualize the life course, think about the role of the welfare state in the lives of older people, negotiate social roles in later life, make meaning of our lives as we age, and cultivate relationships with others during later life. It brings together theoretical concepts and frameworks, methodological advances, and emerging themes and controversies that are redefining gerontology in the era of the Third Age. Highlighting important issues that warrant further exploration and discussion, this book advances our understanding of the Third Age and focuses attention on critical issues that should be addressed in future Third Age research and scholarly development.